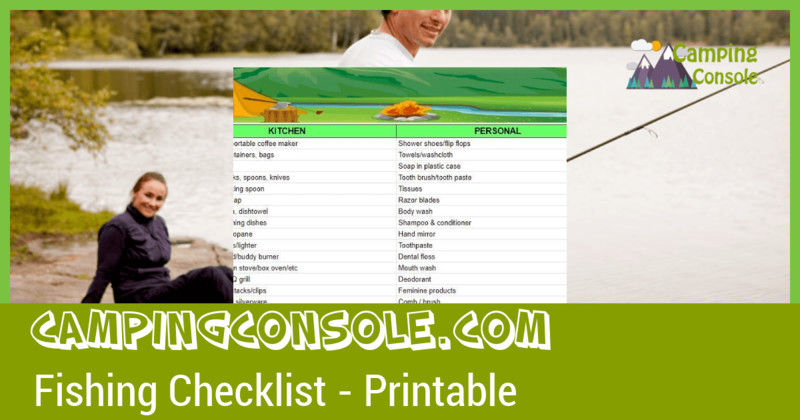 CLICK HERE to download our family camping checklist. Imagine, you’ve spent weeks looking forward to your next camping adventure. A getaway to the great outdoors, family and/or pets in tow, ready to relax amidst the beauty of nature. You drive all the way to the campsite and set up your tent(s) only to discover…you forgot something important because you didn’t use a camping checklist. Be it blankets, campfire games, or Buddy’s leash, forgetting an item when preparing for a trip is surprisingly easy, and can mean the difference between a fun and relaxing adventure and serious trouble in some cases. But don’t beat yourself up too hard, it happens to even the most veteran of campers. After all, we’re only human (until the machines take over). To help avoid a simple mistake that can lead to miserable camping trips or dangerous circumstances, we’ve compiled the camping checklist printable for you to download and use for prepping for your departure date. 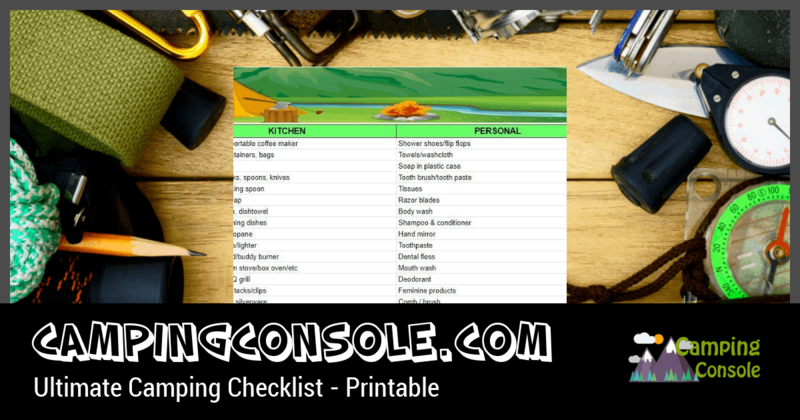 In this guide (and accompanying list), we break down everything from the essentials to the “nice to have” items we suggest bringing along. Items are broken down into easy-to-navigate categories, so you’ll know the why in addition to the what. In other words, there’s a method to our madness. You know what style of camping you’re going for— from week-long excursions in the wilderness, to a tame state park camping ground. Likewise, you know (or should have) studied up on the terrain and weather you might encounter. As such, you’ll need to use some logic when going through the following list. Some items may be more applicable to one situation but not another. For instance, will you be using a winter tent or one for beach camping? Perhaps you’ll need a way to keep your dishes clean or a soap that is environmentally safe to use in river water. You may need extra cooking supplies, or you may be roughing it in a hunting zone. Whatever your plans, and whether you’re a veteran camper or not, our free printable checklist is the perfect preparation tool. Unless you’re going “glamping” with a fully stocked RV or like the latest unique camping items, your campsite will be the primary focus while preparing for your trip. Your readiness in this category determines how comfortable you want to be while sleeping, sitting around the campfire, or simply enjoying the surroundings. 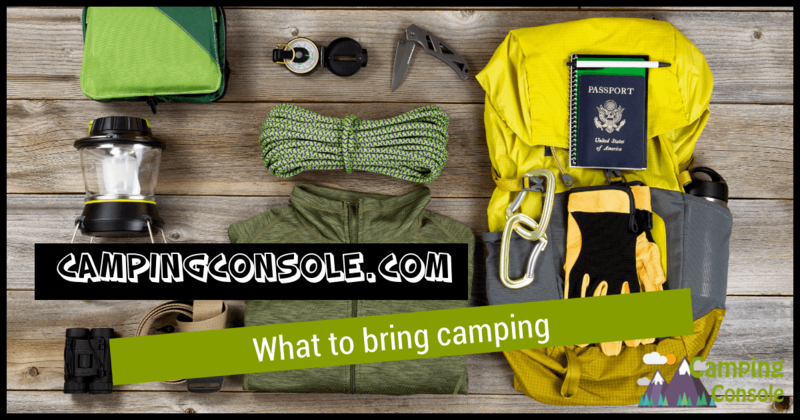 For a full list of Camping gear, CLICK HERE to download our printable list. Don’t worry— you can leave the power drill at home. Tools for a campsite help ensure a safe and secure campsite, a way to collect firewood, and anything you might need for tasks such as digging a fire pit, hanging your food out of reach of animals, or securing your tent posts. From something going bump in the night to exploring nearby caves and late night “potty trips” in the bush, proper lighting for your excursion is essential. From flashlights and lanterns to mosquito-repelling tiki torches, lighting comes in a variety of shapes and forms. Whatever your weapon of choice, you’ll also want to pack back-up lighting even if you don’t plan on exploring the darkest nooks of your destination. Remember to plan for the unexpected— a light shower could prevent lighting a campfire as easily as a burn ban due to drought. Likewise, despite the TV commercials, Energizer batteries don’t just “keep on going” forever. Straight-up roughing it isn’t for everyone. Make sure you pack what you’ll need to enjoy your trip and stay moderately comfortable. We’re not talking about “Hilton” comfortable here, but you don’t want to be miserable either. You may want to take some extra precautions against mosquitoes or ensure you have comfortable places to lie down, sit, or just relax. You also want to know you have adequate protection from the elements and are prepared for bad weather. A properly stocked campsite is essential, no matter your excursion. You can find more supplies to consider on our ultimate camping checklist. From what you want to eat on to how you’ll cook your meals, the kitchen items you pack determine what sort of meals and mornings you’re expecting. Some campers go all out, packing a folding table or a grill, paper plates, etc. Others take a more basic approach to camping meals, only eating what can be skewered and roasted over a campfire or pre-packaged. No matter your level of camping expertise and/or campsite, you want to ensure you have everything you will need to meet your basic food and hydration needs. Know your campsite! Will there be a site for safe fresh drinking water, or do you need to pack your own? Is there an area for trash and recycling, or will you need to bring supplies for keeping your campsite free of litter? Going camping doesn’t mean you have to give up your morning coffee. You can even use dishes— paper, plastic, or standard. Some campers pack their own stoves and fuel to ensure they have their pick of meals. Just be prepared for a bit more effort and clean up when it comes to these items. If we want to continue enjoying our environment, we need to help take care of it. Ensuring that you pack items for campsite clean-up and washable, reusable dishes instead of plastic is a good start. From what you eat on to the soap you use to clean it, you have a myriad of ways to be eco-friendly while keeping your family fed on your trip. From necessities to pleasantries, our family camping checklist has everything you need to consider and pack to ensure no one starves or suffers from caffeine withdrawals during your trip. Camping isn’t just about the excursion. It’s about you. Reasons for camping can vary: from time to relax in solitude, to investigating the wonders of nature with your family. Regardless if you’re into relaxing in the serene or hiking through the extremes and putting your body to the test, you’ll want to make sure you have what you need to take care of yourself throughout the trip. Whether you’re a necessities-only camper or a luxurious-outing glamper, you want to ensure you have what items you need to keep up your personal hygiene. For some, this is as simple as a river-friendly soap and a travel toothbrush. For others, this includes razors, deodorant, wet wipes, and cosmetics. When you’re out enjoying nature, you don’t always have the luxury of urgent care clinics or first aid stations. Make sure you’re prepared for your extended trip! If you’re showering or bathing in community areas or rivers, be sure you have everything you need for a pleasant and safe experience. Comfort can mean different things to different people. Perhaps you are comfortably roughing it, letting your beard grow in and only bathing if you’ve encountered a mud trail. Maybe you’re only comfortable if you have a relaxing shower every morning and soft towels with which to dry. Whatever your preference, pack to match it. You want to enjoy your trip! Newer campers may want to start off with a more luxurious experience and work their way up to the survivalist method over a series of trips. No matter your style, it’s easy to forget an item and regret it for the entirety of your trip. That’s why you should check your packing against our family camping checklist! 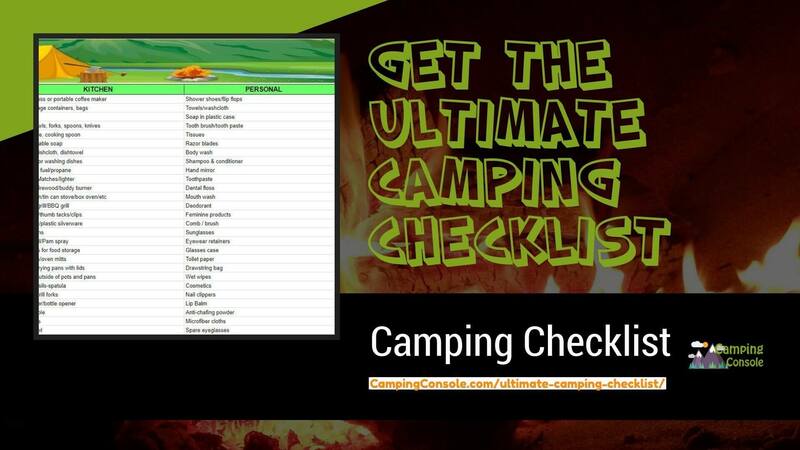 For a full list of personal Camping items, CLICK HERE to download our ultimate checklist. One of the most essential and yet most overlooked categories when packing for a camping trip is First Aid items. Emergencies rarely happen when it’s convenient, and they can be devastating when you’re out in the middle of a campground or hiking in a remote location. Additionally, those with chronic conditions or allergies will need to ensure they have the supplies needed for the duration of their trip and some extras in case of delays. No matter the difficulty or extent of your camping trip, you don’t want to be without these first aid items. Nursing stations may be hard to come by or nonexistent, so you want to be prepared. The first concern is any personal medications; make sure you’ve packed a little extra in case your trip is delayed or something happens to a couple of your pills. Other examples of basics are listed below. When you’re out enjoying nature, nursing stations can be hard to come by. Emergency services may miles away. If someone is injured during your trip, make sure you have what you need to treat their injuries or stabilize them until emergency services can reach you. The more extreme campers among us can find themselves in even more harrowing situations. While it’s rare to be involved in an accident that can lead to your story spreading like wildfire, accidents do happen every day. Make sure you’re prepared to help yourself until you can either return to a more populated area or reach emergency services. Know what is near your campsite and plan your first aid kits appropriately. Use any resources that your site offers and compare them to our ultimate camp list so you can relax on your trip knowing you’ve done everything you can to prepare. Some campers get so caught up in their campsite and first aid items that they forget to narrow their focus to themselves. Packing the proper clothing is essential to enjoying your time on your trip. Let’s face it: wearing shorts and flip-flops in the middle of the woods isn’t for the faint of heart. Swimsuits are great for beaches, but not really useful when hiking in the snow. Depending on where you decide to camp, standard day and night clothes may not apply. You could be dealing with balmy days and frigid nights. Some campers choose not to pack sleepwear and simply sleep in the clothes on their back, but that’s not for everyone. Check any weather reports leading up to your trip for an idea of temperature and climate. You’ll also want to have an idea of terrain so that you pack the proper footwear. Some overgrown areas may require gloves to protect your hands while working through the brush. Frigid climates will require insulated clothing; quick-dry outfits are better for hot, sweaty trips or the ability to dip in available water to cool off without having to change into a swimsuit. We all remember the cliché of a mom insisting you take a jacket even when it’s 90 degrees out. When it comes to camping, however, this idea applies. Meteorology is not 100% accurate science by any means, and weather reports aren’t always on point. When you’re in the middle of nowhere, you might not have the option of a gift shop or just dashing home. A core component of any camping excursion is the safety of you, your family and others in the area. As a responsible camper, it is your duty to do your part to ensure that measures of safety are taken. Remember, if you get lost, it could take rangers days or weeks to find you. Expect the best but prepare for the worst. CLICK HERE to download our family camping checklist including a complete list of safety items and concerns to prepare for. All this preparation may have you starting to stress about your trip. Don’t forget, the main purpose of your venture is to enjoy yourself! Whether you’re camping to relax, to explore, or to spend time with your family. Pack a few items that you can all enjoy together or that will help you unwind. If you’re camping in a group, sports and games are a great way to hang out and have a blast. From a Super Soaker battle with the kids to a round of Ultimate Frisbee, the options are limitless! Sports and board games can go hand-in-hand as fun activities to bond over during your trip. Equipment: nets, racquets, balls, etc. Fishing and camping can be synonymous. Is kicking back on shore, in a boat, or knee-to-waist deep is to your taste— or if you enjoy cooking what you catch— then make sure you don’t miss out on these essentials. Fishing Gear: rod and reel, line, etc. If fishing isn’t your style, don’t worry! There is something for everyone when it comes to camping. Relax under a tree with your favorite book or take advantage of a unique geocaching location. Climb some boulders, sketch in your nature journal, or knit by the campfire. Make your trip yours by doing what you enjoy. Whatever your style of relaxation and enjoyment, our free printable ultimate list will remind you to leave some room for fun. Camping doesn’t have to be an adult-only affair. However, if you take the kids along, you’ll want to make sure you have everything you need to meet their needs while still making sure everyone enjoys the camping trip including you. While every parent knows to pack the essentials like diapers, diaper waste bags, and wipes, camping can also call for a few unique items such as to enjoy swim time or take extra care against the elements. Humans aren’t the only family members who enjoy an excursion. Your pets may very well be accompanying you! While the essentials like food may be a no-brainer, you’ll want to ensure you don’t forget anything in the flurry of packing leading up to your trip. Even if these items seem obvious, it’s easy to overlook something when packing. Check your packs against our list to ensure that you have everything you need for a fantastic experience with your kids— human or otherwise. Just because something doesn’t fit in a category doesn’t mean you should leave it behind! Plenty of items may be specific to your trip and interests, and that’s OK! If you’re going to enjoy nature at its best, consider a pair of binoculars to observe animals at a distance. Hikers may want to pack trekking poles for rough terrain, while photographers and simple memory-makers will want to remember their cameras and supplies. While our massive checklist suggests these items and more, don’t be afraid to back beyond the list— just make sure to check your packing against the list so you don’t forget anything. Packing can be a long and tedious process, but the result of a well-stocked camping trip is worth all the effort. By using our free printable camping checklist, you can rest easy knowing you have everything you need or might need, in the event of poor weather or emergency. Proper preparation can take some of the pressure off so that you can relax and enjoy your camping trip. Don’t be afraid to adjust the list to meet your preferences. Not everyone wants to go fishing, and that’s OK! It’s not required to have a good time outdoors. You and/or your family can even sit down around the camping checklist before getting ready for your trip, discussing what options are already listed and what someone would like to add. This way, you still have a solid list that you can check off as you pack. Whatever your style and process, a great adventure awaits! Take some time to enjoy yourself and breathe in all that nature has to offer.